approximately $22,000 pa and usually supports both members of a couple. That average pension is $1,000 less than the combined married rate of Age Pension. more favourable tax treatment than Commonwealth superannuants. it were indexed using a wage-based index as is used for the Age Pension. • The cumulative loss over that period is almost $70,000. represents about one tenth of one per cent of the 2006-07 Budget surplus of $17.3 billion. isn’t an appropriate means of measuring cost of living increases. zero movement in the CPI in the six months ended 30 March 2007.
is a measure of inflation, NOT a measure of the cost of living. community standard for indexing their superannuation pensions. 15+ Cream, Lotion, and Solarstick, Ego Sun Sense 30+, Aquasun. Nucolox, Normacol, Metamucil, Coloxyl with Senna, Senokot, Glycerine Suppositories. Micropore Tape, Cutilfilm Plus Waterproof Dressings, Melolin Dressings, Handy Banages, Cotton Wool, Betadine Antiseptic, Solugels, Barrier Creams, Disposable Gloves, Prantal Powder. Proctocedyl Ointment & Suppositories, Anusol. The Oxford English Dictionary does not record the term "monkey" or "brass monkey" being used in this way. The purported method of storage of cannonballs ("round shot") is simply false. Shot was not stored on deck continuously on the off-chance that the ship might go into battle. Indeed, decks were kept as clear as possible. Furthermore, such a method of storage would result in shot rolling around on deck and causing a hazard in high seas. Shot was stored on the gun or spar decks, in shot racks — longitudinal wooden planks with holes bored into them, known as shot garlands in the Royal Navy, into which round shot were inserted for ready use by the gun crew. Shot was not left exposed to the elements where it could rust. Such rust could lead to the ball not flying true. Indeed, gunners would attempt to remove as many imperfections as possible from the surfaces of balls. The physics do not stand up to scrutiny. All of the balls would contract equally, and the contraction of both balls and plate over the range of temperatures involved would not be particularly large. The effect claimed possibly could be reproduced under laboratory conditions with objects engineered to a high precision for this purpose, but it is unlikely it would ever have occurred in real life aboard a warship. Michael Quinion Brass Monkey weather. World Wide Words. Retrieved on July 21., 2005. Beavis, Bill Salty Dog Talk: The Nautical Origins of Everyday Expressions. Sheridan House. ISBN 0-924486-82-1. King, Dean A Sea of Words. Henry Holt. ISBN 0-8050-3816-7. Lighter, J.E. Random House Historical Dictionary of American Slang. Random House. ISBN 0-679-43464-X. The Compact Oxford English Dictionary. Clarendon Press. ISBN 0-19-861258-3. The Oxford English Dictionary.. Oxford University Press. What's the origin of the term "brass monkey"?. AskOxford: Ask the experts. Retrieved on July 21., 2005. If the interests of the nation's returned warriors are now featuring in the consciousness of federal politicians, can an election be far away? Labor leader Kevin Rudd opened the bidding for the hearts and minds of the returned Diggers with a promise to increase the pensions of all disabled war veterans by up to $30 a fortnight. These increased benefits would apply to some 140,000 former military personnel. "Veterans have sacrificed so much for our nation and they deserve more than having this Government tell them they have never been better off," Rudd said. This is all very noble but as far as I can ascertain, there have been no reports of ex-Diggers leaping out of their wheelchairs or casting aside their crutches and doing cartwheels down the street on hearing there was a chance they'd score an extra $2 a day. Beaten to the punch by Rudd, Prime Minister John "It's My Party And I'll Go When I Want To" Howard suddenly remembered that returned service persons could vote. The Prime Minister, you may recall, likes nothing better than to be photographed with men and women in uniform and, at one point, sneaked into Afghanistan, staying just long enough to stage a photo opportunity with our troops before returning to Canberra at high speed. Of such deeds are legends born. Given his obvious admiration for men and women in uniform and his willingness to send them wherever George W. Bush thinks they should serve, the PM could hardly allow this naked grab by the Labor Party for their support to go unanswered. As quick as you could say "What weapons of mass destruction? ", Howard knocked together a package for disabled veterans that would give them an extra $20 a fortnight, indexing the pensions to keep pace with inflation and lifting the pensions of those with extreme disability by $15 a fortnight. Politics is a tawdry business at best but when it comes to the treatment of those who have fought for their country, tawdry falls somewhat short of adequately describing the attitude of government towards them. Once every three years, they are acknowledged and handed another dollar or two a day and then ignored. Three years later, when the trumpets sound the calling of another election, the government attempts to mute any criticism that might be forthcoming from the RSL during the campaign by tossing another handful of coins in the direction of returned service people. I have watched the workings of the Department of Veterans Affairs at close hand and it begrudges every cent spent on those who have risked their lives for this nation and who are now suffering serious health problems. World War II ended 62 years ago and those who served are old men now. I've watched my father, a veteran of the New Guinea campaign, fighting Veterans Affairs for benefits as once he fought the Japanese. He turned 89 last week and he's still fighting the bureaucrats for what he believes are his rights. When he returned from New Guinea he had asthma and has suffered from it chronically all these long years. He didn't have it when he left for New Guinea so you might think there was a bit of cause and effect in play. The Government begs to differ. He's 89 for God's sake. Do you reckon the Government might grant him his demands and allow him to savour the delights of a victory over departmental callousness for those years he's got left? It has ever been thus. Politicians, the majority of whom historically have shown a disinclination to don a uniform, are always eager to wave the troops goodbye as they head overseas to do their government's or, in the case of Iraq, another government's bidding. When the smoke of battle clears, however, and the last millilitre of political gain has been wrung from the exercise, no one wants to know about those who suffer the ongoing effects of their service. They become an inconvenience to be acknowledged on April 25 and then ignored. If the Prime Minister is so committed to the welfare of veterans, you would wonder why the Department of Veterans Affairs has been secretly scaling back operations in Queensland prior to shutting down shop and moving to Sydney and Melbourne. Appeal and review work now done in Brisbane will be shifted interstate. Veterans Affairs Minister Bruce Billson, who hadn't bothered to mention this plan to the RSL or anyone else with an interest in proceedings, huffed and puffed when the scheme was revealed saying while he was "totally committed" to servicing the needs of veterans, "to accommodate fluctuations in workload from time to time, the work from one state may be moved to another". This is ministerial crap-speak for "We're shutting down the Queensland operation" and the type of "commitment" the veterans can do without. If Rudd wins office, he might look at according these people the dues they deserve and not insulting them by handing out the latter day equivalent of mirrors and beads every three years. The new RAN Heritage Centre, Garden Island, has more than replaced the old Spectacle Island Repository. There is a story that there was a victualling storekeeper at the Royal Edward Victualling Yard, Pyrmont, before World War I, who did not fully follow directives from the newly established Navy Office, then in Melbourne. When a CNO came around, directing that certain items of victualling stores be discontinued, he was meant to put the surplus items up for disposal and that could include sale. He did follow the directive but also put a sample under the counter and forty years later, when he retired shortly after World War II, he had amassed a collection of badges, clothing, brushes, crockery, cooking utensils and so on. That post-war era coincided with the then still quite young RAN realising that something should be done to retain some aspects of historical interest. CNS, VADM Sir John Collins, was not dismayed to hear of the collecting that had preceded his proposal to initiate a historic collection. Over the years, the historic collection was housed at Spectacle Island; however, there was always the tyranny of water transport that prevented easy access for the wider public to view the collection. 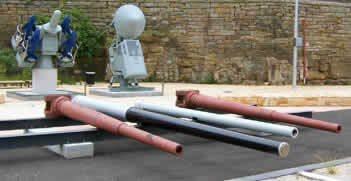 In keeping with its original purpose, the Heritage Centre building displays old gun barrels, along with a Seacat launcher (background). 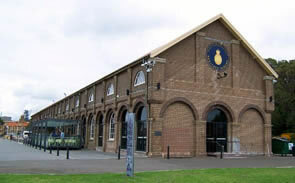 In recent years Navy Office agreed to establish a Heritage Centre at Garden Island in a building that itself is of historical interest. The gun mounting workshop was opened at the northern end of Garden Island in 1922 to maintain guns from cruisers and destroyers. In the 1970s it became the FIMA (Fleet Intermediate Maintenance Authority) workshop and in the late 1990s it was renovated with a proposal to become a functions centre. Following the reclamation of land on the eastern side of the island, the former boatshed and slipway, built in 1913, became isolated from the water. After some years of neglect it was restored to provide a headquarters for the Naval Historical Society. The RAN Heritage Centre is now located in and around the gun mounting workshop with the boatshed forming one boundary. The public can visit this important link with Sydney’s formative years by commuter ferry from Circular Quay. Alighting from the ferry, visitors have access to the knoll of what seamen from the First Fleet’s HMS Sirius called “the garden island”, having been granted access to the island to grow vegetables. Some of those jolly jacks appreciated their association with the new colony and carved their still visible initials and the year, 1788, into a rock. The former signal station on the knoll has been modified to allow visitors to enjoy a spectacular 360 degree view of the harbour. 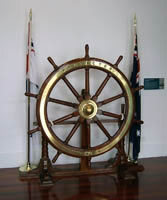 Several memorials and relics have been established near the gun mounting workshop over the past 30 years and include the bow of HMAS Parramatta I, the first ship built for the newly formed RAN, the flag mast from Tresco and memorials to our County class cruisers and Bathurst class corvettes. This sturdy boom boat raised the midget submarine alarm in 1942. Between the workshop and the boatshed are several items familiar to salts of yore—an Ikara launcher, a Seacat launcher, four-inch, 4.5-inch and five-inch gun barrels, an anchor from HMAS Melbourne II, the mast of HMAS Vendetta I and several radar aerials. The cradle for a 12-inch barrel is presently empty. The gun mounting workshop houses two displays. Large items in one group include the centre section of one of the Japanese midget submarines that attacked Sydney Harbour in 1942 and the boom boat that first raised the alarm. There is a fully rigged Montague whaler, a pump from HMAS AE1 and the figurehead from Windsor Castle, a sailing ship built in 1876. 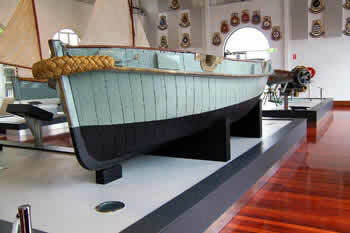 The main gallery, on two levels, allows visitors to experience the Navy’s story and gain a greater understanding of the Navy’s contribution to Australia’s history and development over the past century. Along one wall is a timeline from 1788 to the present with events significant in naval affairs listed. There are items from the Boxer Rebellion up to the Persian Gulf, with World Wars I and II, the Cold War, Korea, Vietnam, Confrontation and peacekeeping missions in between. Different aspects have been grouped to illustrate the RAN’s widely varied skills and roles – aviation, medical, training, weapons, diving, navigation and engineering and so on and there is representation of Jack at sport and leisure. There is a periscope, wrongly claimed to be the only fully operational one available to the public. The other one is in Holbrook. There are several groups of medals, including those of our late member CAPT Peter Daish, and extracts of diaries, reports and letters amplifying particular campaigns. Those wishing to note the wisdom of SBLT Fred Lane should not leave without reading his remarks about armed reconnaissance in Korea. The curators still have some work to do and this is in hand. There is a splendid dress tailcoat from the 1930s—as yet without a card explaining the owner. I suspect he might have been the late CAPT Bill Cook. 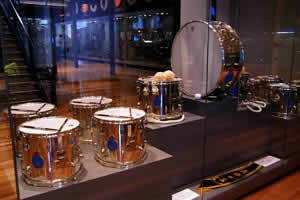 Other items displayed include the silver drums of the RAN band (left) and the wheel from HMAS Protector. There are two examples of diver’s badges that face in opposite directions and two examples of an artisan’s badge that have the axe and mallet on opposite sides, without an explanation of why they have been displayed. The diver’s branch badge has faced right for the past 60 years and my chart showing the artisan’s badge has the axe head to the left. Are these like the stamp collection whose owner values the printing errors more than the regular stamp? Those who served in Perth II in 1969 will remember David Burchall presenting the top of a voice pipe recovered from Perth I in Sunda Strait—that priceless artefact is here on display. From the sharp end one can view examples of ammunition from cannon balls to a 12-inch projectile with 76 mm, four-inch, five-inch and eight-inch in between. There is also a display of personal weapons, including machine guns, rifles, pistols, bayonets, swords and cutlasses. The splendid display of silver includes trophies for long past regattas, wardroom silver and the silver drums made for the 75th anniversary of the formation of the RAN. There are ships’ bells, lifebuoys and battle honour boards and a re-creation of a mess deck from the 1920s. Ahh, it don’t blow nearly so hard at sea these days. o make a visit a priority in your calendar. Replenishment at the Salthorse café and a ferry ride on the harbour is always a treat. The Minister for Defence, the Hon. Joel Fitzgibbon MP, today launched the Defence White Paper Community Consultation Program and released a public discussion paper ‘Key Questions for Defence in the 21st Century’ during an event at Parliament House. ‘The Community Consultation Program is an important part of the White Paper development process. As I have said previously, building stronger community interest in the future of Defence is a priority for the new Government and this program will give the Australian community the chance to have its say in the role of our Defence Force.’ ‘As a key component of this program, the public discussion paper will help us to generate ideas and expand the public debate about Defence and security that is so essential to the White Paper process. The paper will inform and encourage discussion among interested members of the general public as well as the wider Defence community, and will also encourage consideration of the many facets of Defence business and more general Defence policy.’ ‘The Community Consultation Program will include opportunities for public contribution during open meetings in major capital cities and key regional centres across the country.’ ‘In addition to the community consultation activities, there will also be separate opportunities for dialogue between the panel and State and Territory politicians, industry representatives and Defence analysts and commentators.’ During the event the Minister also announced the remaining members of the Community Consultation Panel who will manage the consultation program. ‘I am very pleased to announce the appointment of Rear Admiral Simon Harrington (Retd), Professor Tanya Monro and Mr Peter Collins to join Chair Mr Stephen Loosley and Deputy Chair Mr Arthur Sinodinos as members of the Defence White Paper Community Consultation Panel. ‘Together, Rear Admiral Harrington, Professor Monro and Mr Collins will bring a wealth of experience to the program with professional backgrounds in the military, business, science, research, legal and political sectors.’ Mr Fitzgibbon said. A copy of the public discussion paper, program of consultation activities and biographical details for panel members can be accessed via: www.defence.gov.au/whitepaper Media note: Images of today's event will also be available via this website later this afternoon. An easier process for veterans and ex-service personnel to claim compensation and benefits is a step closer with a new trial commencing this month, the Minister for Veterans’ Affairs, Alan Griffin, said today. Mr Griffin said a new single claim process will make accessing compensation more straightforward for those veterans and ex-service personnel who may have entitlements under more than one Act administered by the Department of Veterans’ Affairs. “Depending on their service, veterans and ex-service personnel may be entitled to benefits under three different Acts – the Veterans Entitlements Act 1986, the Safety, Rehabilitation and Compensation Act 1988 and the Military Rehabilitation and Compensation Act 2004,” Mr Griffin said. “To date, veterans wanting to claim under more than one Act needed to submit a separate claim form for each Act. Mr Griffin said understanding which legislation relates to their claims can be confusing for veterans and ex-service personnel. “The introduction of a single claim form will help reduce this confusion and is an important step forward in improving the overall claim process for veterans,” he said. The new process will be trialled over the next two months in Perth, Melbourne and Brisbane, working with specific veteran advocacy centres located in these states. “My Department is working closely with ex-service organisations and members of the veteran community to ensure the new process is effective in helping veterans access their rightful entitlements and easing the claims process. If successful, the single claim process will be expanded as soon as possible,” Mr Griffin said. This trial complements other initiatives designed to improve the transition for members leaving service, particularly those who have to deal with multiple agencies. A roof over your head is something most of us take for granted and we worry only about paying the bills to keep it there. Everyone, however, is not so blessed and veterans are not immune to the problems of homelessness or the near threat of it, A recent series of events has caused many of us concern as they appear not to be isolated and steps are currently being taken to try to solve the problem of homelessness and create better households for those in difficulty. The aetiology of this problem is multifactorial and often a combination of these factors. Broadly they can be placed in the following groupings: drug habituation of one variety or another, prolonged unemployment with the concurrent loss of skills and therefore earning power, and thirdly mental illness, mental arrested development in all its forms or cerebral disease/pathology. More than one of these problems per person makes life doubly difficult. So the origins of homelessness are not simple in diagnosis or easy to treat. Successive governments have not always helped the situation in the past. Specifically, the fashion to close so many psychiatric units through-out the Nation in the middle late eighties exacerbated the problem to a very large extent as one of the recognized causal factors was significantly increased when these former in-patients were forced to cope on their own. So, apart from providing sufficient finance for public housing, there will need to be extra prongs to this attack to reduce the number of homeless on our streets. These additional approaches must include improved mental health facilities both at an in-patient and out-patient clinical level. Our country must be prepared to spend much more than it currently does on drug addiction rehabilitation and education. We have seen the marked reduction in nicotine use over the last ten years, through the prolonged educational efforts of State Departments of Health and there is no reason why the same cannot occur with other more rapidly lethal drug consumption. The widespread use of a variety of “recreational” drugs is relatively new in this country so the phenomenon is not traditional or ingrained in anyway, so the moment the young believe it to be unfashionable or un-cool the percentage of usage will drop significantly. The success of this approach lies with our health officials. In the mean time, as ex-service organisations, we must come to grips with our own and provide what we can to help. The figures are sketchy at best but a rule of thumb approach will suggest the extent of the task. Depending on whom you approach or read as an authority it would be reasonable to guess that there are 12,000 people in this country without a roof of their own to sleep under tonight. Of this number we believe 8 to10% would be veterans, giving us a figure of 1000 to 1200 nation wide or several hundred per state if averaged out. Now as the eastern sea board has the lion’s share of the population we can expect to have more than our share of this number. These figures do not mean that all these individuals are necessarily sleeping in the streets at any one time. The figures do mean that the accommodation is temporary and people must be moving on; be it from church, family, charity or unoccupied premises. Our best efforts must be focused on bringing this cycle of movement to and end, as quickly as we can, where possible. A young Gulf War veteran in 2000 developed a significant brain lesion requiring surgery and long term care post operatively. Once discharged, he found himself unemployable because of his difficult to control epilepsy, despite medication and on a very limited pension income. His wife and one child were initially unsupportive and he was by definition, “on his own.” Problem solved you might think. Visit your friendly neighbourhood RSL/Ex service organisation and all will be sorted. Well he did and it wasn’t !! This late thirty year old man visited no less than six sub-branch offices in our state before moving to Victoria to gain the assistance he so desperately needed. I do not know the fine details of each visit to each organisation nor would that knowledge serve any purpose but to underscore the rigidity in some of our approaches to veteran community members. Common replies he received to requests for assistance were,” You aren’t a Vietnam Vet. Can’t help” or “ You’re not old enough for that type of assistance” and “ Your problem is not service related”. I feel the point is made that there are still people in our own organisations who are not offering resources advice in a manner designed to assist veterans. If you claim to be a pensions or welfare officer you are obliged to keep abreast of the veteran services available in your community on a day to day basis. Otherwise we are not maintaining the standard of help we loudly claim to provide. As a result of this man’s trials and tribulations he and I have put together an initial ex-service accommodation provider plan with the following outline. A company called SCV GROUP LIMITED based in Maroochydore, Queensland is the manager of five thousand seniors independent living accommodation units throughout Australia. I was invited to address the Managing Director and senior executives on their recent visit to Sydney and have subsequently retained contact with their National Business Manager Mr Ian Minett. While the units are principally designed for seniors there is the potential to integrate other age groups into the communities . There are no entry fees with the accommodation being offered inclusive of meals and a heavy laundry service in regional locations for less than $290 per week. The exact figure for this rental will vary a little depending on the site and the accommodation options offered at each community. These rentals will be made available on a case by case interview basis and the ex-service person will require some income, plus or minus rental assistance if necessary. So it will on occasions prove a testing task for those assisting the veteran. What is so very significant about what has been done here? The company is one with an Australia wide approach so we are not dealing with many groups with different policies in place. There is no particular age restrictions when people are more suited to a village atmosphere accommodation. Individuals are encouraged to belong to the groups they find themselves in and not retain their isolation. The tolerance of varying medical conditions is found to be acceptably high. Purposefully disruptive behaviour is obviously not tolerated. Tenants are able to move about the Groups holdings when accommodation becomes available. Now this SCV facility has been made available to veterans throughout the whole country, it is timely that our community should commence using it. The need is there and part of the solution is now provided; it is up to us to match the veteran with the available accommodation site and allow these men and women to get on with the rest of their lives under their own roof. PLEASE RING THE SCV GROUP ON 1800 356 544 FOR THE ASSISTANCE YOU WILL REQUIRE.